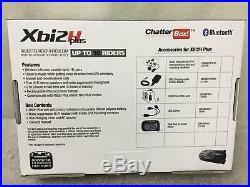 New CHATTERBOX XBI2-H Plus, HJC Motorcycle Helmet Bluetooth Intercom Kit/System. 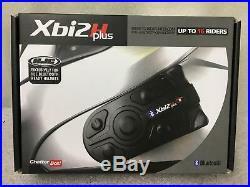 XBI2-H Plus, HJC Motorcycle Helmet Bluetooth Intercom Kit/System. BRAND NEW, COMES AS PICTURED. Designed for use on the HJC IS-Max BT, CL-Max II and Sy-Max III Helmets ONLY. Full duplex wireless intercom capable up to 16 users. Backwards compatible with the XBi2 Plus Bluetooth Communication System Not compatible with the XBi2-H. Listen to music while getting voice direction from GPS wirelessly. Up to half mile range (line of sight in optimum conditions). 8-10 hours of operating time and 20 hours of standby. XBi2-H Plus unit with factory installed rechargeable Li-Poly battery. Noise suppression Hi-Fi headset with Cradle and mounting hardware. USB charging cable and AC adapter. All of our items are tested and are fully working unless otherwise stated in the Listing. Actual Images of item are shown above. The above fitment specs are a result of an abundance of in depth research. We try our best to represent our items but are still humans and sometimes mistakes may happen. Listing and template services provided by inkFrog. The item "New CHATTERBOX XBI2-H Plus, HJC Motorcycle Helmet Bluetooth Intercom Kit/System" is in sale since Friday, August 25, 2017. 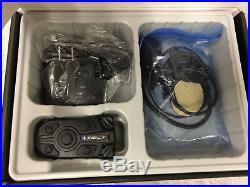 This item is in the category "eBay Motors\Parts & Accessories\Motorcycle Parts\Electronics & Navigation\Intercoms". The seller is "vns4less" and is located in Avondale, Arizona. This item can be shipped to United States, Canada, United Kingdom, Denmark, Romania, Slovakia, Bulgaria, Czech republic, Finland, Hungary, Latvia, Lithuania, Malta, Estonia, Australia, Greece, Portugal, Cyprus, Slovenia, Japan, China, Sweden, South Korea, Indonesia, Taiwan, South africa, Thailand, Belgium, France, Hong Kong, Ireland, Netherlands, Poland, Spain, Italy, Germany, Austria, Bahamas, Israel, Mexico, New Zealand, Philippines, Singapore, Switzerland, Norway, Croatia, Brazil, Chile, Colombia, Viet nam, Belize, Saint kitts and nevis, Bolivia, Ecuador, Egypt, Iceland, Jordan, Luxembourg, Macao, Oman, Peru, Pakistan, Paraguay, Uruguay.